SM: 드럼을 치는 강세민이라고 한다. BG: 기타치는 김병규이다. 코러스도 살짝씩 겸한다. C: 보컬하고 기타를 연주하는 최수미다. 왜 Say Sue Me 인가? BG: 제일 처음 시작할 때 베이스 멤버가 달랐다. 모두 이니셜이 'S와M'으로 시작해서 S, M으로 시작하는 걸로 이름을 만들어 보면 어떨까 하다가 나온것이 Say Sue Me 이다. BG: 작년 여름부터. 이제 8개월 째 접어드는 것 같다. SM: I am the drummer, Semin Kang. H: I play bass and my name is Jae-young Ha. BG: I am Kim Byeong Gyu and I play guitar and I do vocals as well. C: I am Sumi Choi. I do vocals and play guitar. Why is your band called Say Sue Me? BG: When we first started there was a different bassist and everyone’s name started with either an S or an M so we thought it would be good if we used those letters for our band name. This is how it came out. How long have you been together as Say Sue Me? BG: Since last summer. So it has been almost eight or nine months? 밴드 생활전에 각자 어떤 일을 했나? BG: 10년전부터 드럼치는 강세민과 기타치는 내가 이것 저것 작은 밴드활동들을 해왔었다. 거기에 베이스로 하재영이 함께했다. 강세민과 나는 다른 밴드도 하고 있었는데 그 밴드활동을 쉬던중 심심풀이로 이 밴드를 만들었다. 보컬을 찾고있었는데 아는 동생이었던 최수미를 만났다. 가사가 모두 영어인데 특별한 이유가 있는가? C: 듣는 음악이 국내밴드 음악보단 해외밴드음악을 듣다보니 그런 감성이랄까 느낌을 알려주고싶었다. 한국어로 표현하는데는 한계가 있어 영어로 작사를 시작했다. 관객들이 영어가사에 대한 거부감이랄까 놀라움은없나? C: 정말 초등학생스러운, 누구나 다 알아들을 법한 영어를 쓰기 때문에 딱히 문제는 없는 것 같다. BG: Before we made the band, Semin Kang and I used to play in several bands. Jae Young Ha played as bass sometimes. We made Say Sue Me just for fun. We needed vocals so we asked Sumi to do it. She was a friend of mine. Is there any specific reason the lyrics are all written in English? C: We listen to bands from other countries...so we wanted to express those feelings and interpretations. We found that there is sometimes a limitation when trying to express in Korean. That is the main reason why we use English. How do your crowds react to you using English? Are they surprised? C: Not really. It is very easy, low-level English that almost everyone can understand, so there is no problem regarding the audience. 노래 제목이 유머러스하다고 해야하나. 재미있는 제목이 많은데. 자연스럽게 나온 것인가 아니면 약간 위트있는 걸 해야겠다! 하고 의도를 한건가? C: 그렇긴 한데. 음,의도한 바는 없다. 재치를 넣어보려고 한다거나. 그런 건 없고 가사에 맞는 제목을 붙인 것 뿐이다. 그렇다면 가사는 어떤 때 쓰나? C: 보통 분노할 때. 늘 가지고 있는 마음속의 분노를 표출한다. 예를들어 I know i am kind of boring같은 경우도 내가 항상 내 스스로를 굉장히 지루하다고생각해서 그냥 자연스럽게 나왔다. Your song titles can seem quite humourous, such as "I Know I am Kind of Boring" or "Sorry That I'm Drunk." Is this something that comes naturally or did you deliberately bring this humourous style to your writing? C: Oh, does it sound humourous? I was pretty serious! Well, what I mean is it is not too profound or anything. C: Yeah, but it wasn’t intended. It just came out naturally. When do you usually write lyrics? C: Well, usually when I’m angry with something I express my anger and fury through writing. For example, for “I Know I am Kind of Boring” that’s what I always think about myself so it just came out naturally. 모두 최수미가 쓴 가사를 만족하나? 나머지 멤버들: 전혀 간섭하지 않는다. 나머지 세 멤버가 가사를 못쓰기 때문에 토를 달 수가 없다. 이렇게 다 도맡아서 해주는 것만으로도 너무 고맙다. 최근에 부산에서 많은 공연을 했다. 부산 이 외의 지역에서 투어를 해보고 싶다는 생각은 없나? BG: 간간히 대구를 비롯 울산, 서울 등에서 공연을 하기도 한다. 그러나 일단 거리상 멀고 다들 직장이 있고 하니 부담스러운 게 사실이다. 불러주시면 너무 감사하고 공연도 정말 재미있지만 현실적으로 우리가 쓰는 비용이 더 많아서 어려운 것이 사실이다. C: 이제 밴드 시작 한 지 거의 1년이 됐다. 앞에서 말했다 싶이 어떤 성공이나 유명세를 위해 모인 것이 아니다.추상적이지만 락스타가 되어서 호주 골드코스트도가고 미국가서 하자. 정도이다. 아직 구체적으로 우리는 이런 밴드가 되고 싶고 하는 생각은 없다. 인디밴드가 그런 구체적인 플랜을 가지면 피곤해지는 것 같다. 그저 우리가 하고 싶은대로 지금처럼 음악을 하고 싶다. Are all members satisfied with Sue Mi Choi’s lyrics? Everyone: For sure! We don’t complain at all. None of the rest of us can write so we do appreciate that she can do that. You've played a lot of shows around Busan lately. Have you any plans to play around the country? BG: We play in Daegu, Ulsan, or Seoul occasionally. But we all have our jobs so it is quite difficult to tour. We really appreciate if someone ask us to travel and play, but realistically it is not always that easy. Do you think it is easier to achieve success playing in Seoul, as you would have a greater chance of exposure and playing for larger crowds? What’s the goal of Say Sue Me then? C: It has been almost a year since we started this band. Like we said before, we didn’t start this band for fame or success. We often make jokes like, “Oh we should be rock stars and play in Goldcoast, Australia, or in the U.S.A.” stuff like that...but that is just like our dream. We don’t have any specific goal or idea that we absolutely want to pursue. I think that would give us too much stress. We would like to just do what we love. BG: 음악적인 것 뿐만아니라 그냥 전반적으로 너무 트렌드에 집착하지 않았으면 좋겠다. 우리가 서울에 이태원에 있는 외국인들 사이에서도 이름이 알려지고 우리를 알아보는 사람들이 많이 생겼다. 그렇게 관심을 가져주시는 이유는 아마 우리가 유행을 타지 않아서 그런 게 아닐까 싶다. 서울 인디밴드들의 음악을 들어보면 유행이 민감하지 않나? 그러면 당연히 특색없는 "거기서 거기"인 밴드가 되는 것 같다. 자기 색을 가지고 하면 더 인디씬이 커지고 발전하지 않을까 싶다. 그리고 부산공연엔 아직 한국인보다 외국인 관객이 더 많다. 발전을 위해선 한국인들이 인디씬에 조금 더 관심을 많이 가져야 하지 않을까 생각한다. 함께 공연했던 밴드들 중에 가장 인상깊은/좋았던 밴드가 있다면? 나머지 멤버들: 지니어스도 좋았고. 우리가 항상 같이 하는 밴드들이 있다. 바비돌스라든가. 그들 모두 좋다. What is your one wish for the Korean indie music scene? BG: Overall, I wish indie bands were not so obsessed with trends. Some foreigners in Itaeweon, Seoul recognize us and like us. We are getting popular. I think the reason is because we have our own colour. We are far behind the trend. If you listen to some indie bands in Seoul they are very trendy but they all sound pretty similar. I guess if more indie bands had their own colour, then this music scene would be bigger. And the other thing is, I hope more Koreans get interested in the indie scene. There are more foreigners than Koreans at Busan gigs. 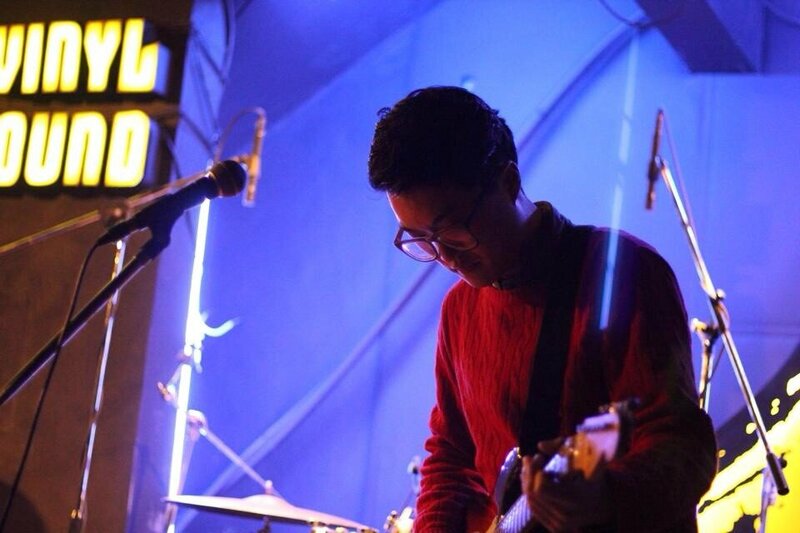 For the indie music scene’s future, more Koreans need to come out and enjoy it. Who is the most impressive and best band you’ve ever played with? Say Sue Me: We love Genius and we often play with the same bands, like Barbie Dolls. We like them. 인디밴드에겐 홍보가 굉장히 중요하다. SNS홍보에 꽤 많은 투자를 하는 것 같은데? SM: 사실 잘 안한다. 그저 공연이 있다 , 앨범이 나온다 정도만 한다. 그리고 페이스북 페이지를 통해서 홍보하는 정도밖에 없다. 이제 밴드한 지 거의 1년이됐다. 돌이켜봤을 때 어떤 점에 변화가 있었나? BG: 곡을 꽤 많이썼다. 그게 가장 중요한 것 같다. 공연도 많이했고. 우리가 열심히 했던증거를 볼 수 있는 거니까. 뿌듯하다. 우리 베이스의 실력도 많이 발전했고. 이제 곧 새 앨범도 나온다. 여지 껏 공연해보지 못한 다른 많은 곳에서 공연할 수 있기를 바란다. Say Sue Me: We are always listening to the same music, like Pavement, Yo La Tango, and Seam. For indie bands, PR seems to be pretty important. Is your SNS (like Twitter) pretty active? SM: Not really. We use Facebook more and it is only updated occasionally. We just post like, “There is a gig this Saturday,”...“New album will be released soon!”...That’s about it. It’s been almost a year now. What has changed from when you first created the band? BG: We’ve written lots of songs and we’ve played lots of gigs. It is our proof. It shows we have done something. So, we’re pretty happy about that. Our new album will be released very soon and we would like to play in many more places.